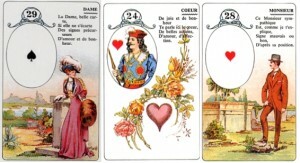 What follows are basic guidelines for reading with the Petit Lenormand. First off, if you don’t have a Lenormand Deck already, I highly recommend the Lenormand Orakelkarten – blaue Eule (Blue Owl) . It is a gorgeous deck, and it will serve you well in your studies..! You can also take a look at my post on What to look for in chosing your first Lenormand Deck. The next thing you need to know is that there are two types of readings you can do with the Petit Jeu Lenormand. The First type of reading is what I call a string. This is where you lay out the cards from left to right in one line. These strings are usually used to answer one question, and are typically composed of 3-5 cards in a spread. It isn’t unheard of to have more cards, but generally people stick to 3 or 5. Here is an example of a string with three cards. 1st Concept: Read the cards from left to right. 2nd Concept: Take the cards’ basic meanings (look here for a list of basic traditional petit Lenormand card meanings) and pair them together. Woman + Love/Attraction + Man = Obviously, these two are smitten with each other. The second type of reading is a two-dimensional tableau where you lay the cards out in a block. 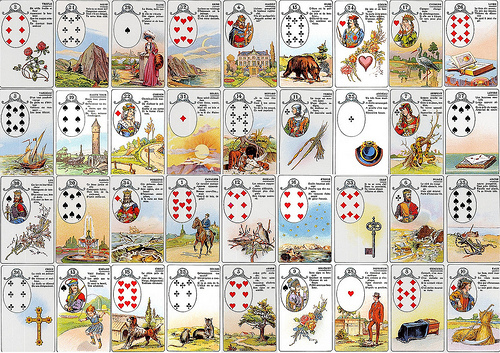 Typically, with the Petit Lenormand, we either lay out all the cards in four rows of nine cards (which we call a 9X4), or four rows of 8 cards, plus 4 fate cards (which we call 8X4 + 4). These are the two most used two-dimensional spreads, but there are simpler ones like the 3X3 where people lay three rows of three cards to form a small square. IMPORTANT NOTE: Some of you might be tempted to use spreads that you’ve seen used with the Tarot. I highly recommend that you do not use these spreads with the Petit Jeu Lenormand and stick to the spreads I’ve suggested here. Combining Lenormand with Tarot is an article where I explain why this is important. 2nd Concept: The past is always represented by the cards to the left of the querent card (on the same row). So in the example above the 3rd column represents the woman’s present (in black). Anything to the left of the 3rd column is her past (in purple), and everything to the right of the 3rd column is in her future (in blue). A card is said to be controled by the querent if it is below him / her. In other words, the querrent can do something to influence things. A card above the querent is said to be influencing the querent. In other word the card is exherting an influence which the querent can do little about. The female querent is making a choice. A choice is being made for her (were the road card be above her).These are by no means the only way to go about reading the cards, but these should be enough to get you started..! If you need some practice, the Learn Lenormand Forum has practice threads for both of these sorts of readings, and you will find plenty of volunteers to assist you in your practice runs! And when the Man is for example in the end of the row what is the future?For that Man? If you mean a Grand Tableau, things are about to change for him. We don’t know what the future is. The spread will probably play out quickly. Yes I mean a Grand Tableau:)Thanks:)I thought so. Thank you for the reply, I have registered on the forum and hope to get lots of information to help me become a fantastic reader, and possibly help others when im good enough! 20 – Garden, 22 Crossroads, 15 The Bear, 16 The Stars and 29 The Priestess. Can anyone help me with understanding? Great job on this website. So full of great information. Thanks a lot! Right now I wonder how you shuffle and cut (or not) the cards. Do you use the same way for both methods? Hi Alice! I’m glad you find the website useful! I normally shuffle the cards and then cut them with my left hand, and I’ve always done it that way… but that’s my personal style! You don’t have to do it that way, and your method is as good as any. Does it matter if the cards fall right side up or upside down? Or are they just always read right side up? Hi Sue – The cards are always read right sign up. The reason why I haven’t written about shuffling / dividing the deck is because it’s a fairly personal choice. For example, whenever I do online readings, I have no choice but to shuffle and cut the deck myself. However, whenever I have a live reading, I do prefer that the consultant shuffle the cards and cut the deck with their left hand. It’s all down to a matter of belief. Do you believe that the deck’s energy will get distorted if too many hands touch your deck? Then you might be one that will do all the shuffling… however, if you’re like me and you want the client’s energy to influence the reading, then go nuts.. (just ensure they have clean hands)! Most of us have many decks, so if you want to keep a deck for “live” readings, have the clients always use that one. I totally understand why you and others wouldn’t want strangers messing with their cards..! Now ask me if I see a difference in the quality of the readings, depending on clients shuffling/not shuffling the cards? Not, really. Though, I do find that if you let them shuffle you get a lot more personal details, and you tend to get their most pressing concerns out into the open. Hi you say that cards under your personal card are influenced by reader; I got Lady+ring+man+tower. But I am single and nobody in my life . how do i need to read this? Hi Topaz – The interpretation of your spread depends on the question you asked. The Ring applies to all kinds of relationships, not just love. If you need help with interpretations, join us on the forum. A few people have asked me that question, and the short answer is not officially. You could assign personal values or alphabetical meanings to your cards if you wanted to, and eventually you might find that the cards will take that into account for you, but I have never felt the need to use this as I normally describe folks to people and they usually relate to whatever I am saying. When you read the interpretation of the cards within the houses,, for example key in the house of clover, do you read it as clover + key or key + clover? this has always confused me.. thanks! The main card is always the one that has fallen in the house. So, I would read KEY as defined by HOUSE. The basic idea would be a key issue with a house, or a problem at home. The main idea is the one behind the Key in your example. what if the man is below the female querent….so that means were male and female affect each other? Thank you for the great site! I’m interested, how to read the fate cards? Whether these four cards to be viewed as a narrative? For example, if the first two cards are positive and the latter two are negative, does it mean that happiness is followed by misfortune and such is the fate of the querent throughout his lifetime? The Fate cards are read just as you would any other card, based on the various techniques you like to use. I do find that people tend to read them “all together” instead of taking their time as they would with other reading though. So at a first glance a reading might indicate that happiness will be followed by misfortune (as you stated in your example), but a closer look might contradict this, so look at the rest of the spread and see if it agrees with your first impression of the fate cards. With Lenormand, you don’t need to read the cards “reversed” like you do in Tarot. The card is influenced by the cards that surround it, and its position in the spread instead.